Solanum, the name (of unknown derivation) of a genus of plants which is the type of a large and important order, the Solanaceae. Some of the conspicuous species of Solanum being popularly known as nightshade, the order or family is often called the nightshade family. The Solanums are annual or perennial herbs, and in warm climates they include shrubs, and even trees, with alternate leaves; the flowers, sometimes terminal or axillary, are often extra-axillary, appearing upon the stem at some point between the leaves, an unusual position due to a more or less complete union between the flower stalk and the main stem. The calyx and wheel-shaped corolla are mostly five-parted or five-lobed, the five stamens with very short filaments, the large, anthers crowded around the style, and opening by a pore at the apex of each cell; the (mostly) two-celled ovary is surmounted by a simple style with an obtuse stigma, and in fruit becomes a two-celled berry containing numerous flattened, somewhat kidney-shaped seeds with a fleshy albumen. 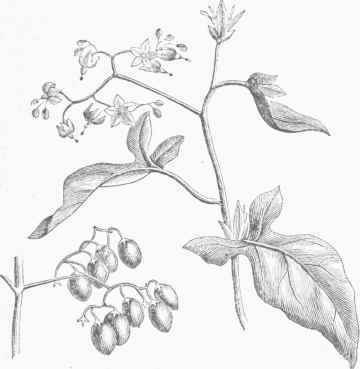 The genus Solanum is extensive; in its latest revision (Dunal, 1852) some 850 well defined species are admitted, and about 100 not sufficiently known are enumerated; they are found in all temperate countries, but in tropical regions, especially those of South America, they are very abundant. The most important species is Solanum tuberosum (see Potato), the tubers of which are so generally used as food. The tomato (described under its proper title) was placed here by Linnaeus, and though later botanists have given it a separate genus, lycopersicum, it can hardly be kept distinct from Solanum. Under Egg Plant is described another cultivated species, and under Nightshade is given a common weed, 8. nigrum. Several species are cultivated for ornament in gardens and greenhouses, and a few wild species, not elsewhere mentioned, are of importance as weeds. - The beaked Solanum (S. rostratum), very abundant on the plains west of the Mississippi, is a much-branched annual, 2 to 3 ft. high and abundantly armed with strong yellow spines; it has yellow flowers, one of the anthers of which is much larger than the others, and, being prolonged into a long curved beak, has given the species its name; the small berry is included in the very spiny calyx. This has been introduced into gardens, and in some places has become a weed; the plant is interesting from the fact that it afforded the Colorado potato beetle its chief food before the introduction of the potato in the far west. (See Potato Bug.) - One of the worst weeds of cultivation is S. Carolinense, known in some localities as horse nettle, and in others as apple of Sodom; it has a perennial root, with prickly stems a foot or more high; the oblong, sinuate leaves prickly on both sides; the bluish white flowers, in small lateral racemes, are succeeded by orange-yellow berries about a third of an inch in diameter. This is especially abundant and troublesome in the southern states, and is sparingly found as far north as Connecticut. It is very hard to extirpate, and in some parts of Delaware it has gained such complete possession of the soil as to lessen materially the value of farms, and in some cases to cause fields to be abandoned. - A climbing-species, S. dulcamara, is popularly known as bitter-sweet; the rind of the stalks is said to taste at first bitter and afterward sweet, a peculiarity recognized in the Latin name, dulcis-amara, given to the plant in the 16th century. It is a native of Europe, is thoroughly naturalized in all the older states, and is not rare in cultivation. The stem is somewhat climbing, and grows to the height of 6 to 10 ft.; it is woody at the base, but the upper part is killed back every winter; the leaves are usually ovate-heart-shaped, but frequently the upper ones have a lobe on each side at the base and become halberd-shaped; the flowers are in small cymes; the corolla is pale blue or purple, against which the large yellow anthers appear in strong contrast, and make them rather showy; they are succeeded by an oval berry about half an inch long, and bright red; the plant begins to bloom in June and continues till autumn, and flowers and fruit in every intermediate stage up to full ripeness may usually be found upon it. 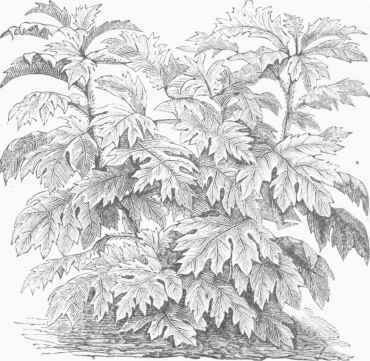 Though bittersweet has been in use as a medicine for some centuries, there is very little positive knowledge concerning it; it appears to contain a very small amount of solanine in, a modified form; it has been used in gout and rheumatism, in various affections of the chest, and in skin diseases. The berries are very showy, and, being not unpleasant to the taste, are liable to be eaten by children; in regard to their effects there is the most opposite testimony; some authors assert that they are highly poisonous, while Garrod says that he has administered to a patient half a pound of the fresh berries daily with no ill effect. - Several species of Solanum are ornamental plants in the greenhouse and garden; some of these, valued for their ornamental fruit, are described under Jerusalem Cherry. The jasmine-like Solanum (8. jasminoides) is a tall, climbing house plant from Brazil, with dark green, smooth, ovate or heart-shaped leaves, and large clusters of white or slightly bluish and pleasantly fragrant flowers, produced in profusion; it is an admirable greenhouse climber, and is often planted out in summer; in the southern states the root remains alive through the winter. Some of the erect tropical species have a very robust habit of growth and ample foliage; in some the large leaves are handsomely cut; in others they are marked by pleasing contrasts of color, and the flowers are often showy. Among the best are S. crinitum,, S. macranthum, S. marginatum, and S. Warscewiczii, which grow from 3 to 8 ft. high and are highly ornamental.